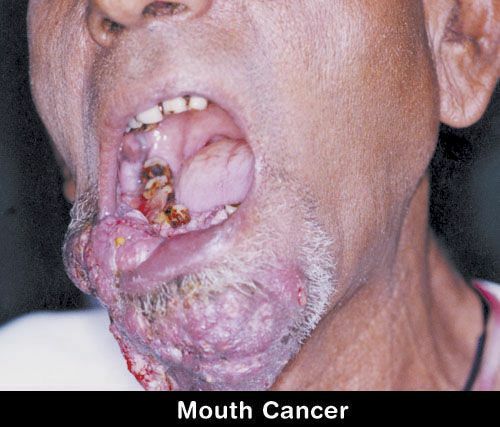 The most common oral cancer is squamous cell carcinoma. It is estimated that about 90 percent of people with oral cancer suffer from this type. Other types of oral cancers are malignant oral melanoma and adenocarcinoma. Malignant oral melanoma is a cancer that develops from the melanocytes cells in the mouth. While adenocarcinoma is a cancer that attacks the salivary glands. Thrush that does not heal in a few weeks. Red or white spots in the mouth. Lumps or thickening of the inner wall of the mouth that does not go away. Swelling of lymph nodes that do not heal. Difficult or painful swallowing and chewing. A rocking tooth with no obvious cause. Change of voice or speech (eg be lisp). Jaws that feel stiff or sore. Symptoms of oral cancer also tend to be difficult to recognize because it is often similar to other disease indications. Stay alert and consult a doctor immediately if the symptoms do not heal for more than 3 weeks, especially for heavy smokers or people who often consume liquor. Using all kinds of tobacco, such as cigarettes, cigars, and chewing tobacco. have an HPV infection ( human papillomavirus ). Oral hygiene is not maintained, such as allowing cavities or gums that are infected. In the process of diagnosis, your doctor will ask for your symptoms and check the condition of your mouth. If suspected of having oral cancer, you will be advised to undergo a biopsy or tissue sampling to ensure the presence or absence of cancer cells. Incisional biopsy . In this method, the patient will be given local anesthesia on the area to be incised. The doctor will then slice a small portion of the part to be examined. The cut incision will then be sewn again. Aspiration Case Needle Cyst . Also called fine needle aspiration cytology (FNAC), and is often selected when there is swelling in the neck region that is suspected to come from cancer cells from the mouth. This procedure is usually performed simultaneously when the doctor performs ultrasound examination. Nasendoscopy . Nasendoscope is a flexible long tube-shaped tool with a camera at the end. This device is inserted from the nose to the throat, and is usually done when suspected of malignancy in the nasal area, throat (pharynx), or vocal cords. The patient will be given a local anesthetic in the form of a spray before the procedure is performed. Panendoskopi. This procedure is performed using general anesthesia. In general the process is almost the same as nasendoskopi, but using a tube of larger size. With this procedure, we will get a clearer picture of the condition around the nose and throat, and can also remove small tumors. Patients who are positively diagnosed with oral cancer will undergo further tests to detect the stage and extent of development of oral cancer. This procedure can be done through endoscopy, X-ray, MRI scan, CT scan, and PET scan. After performing a series of necessary checks, your doctor will then be able to evaluate the severity of your cancer by using a classification method called TNM. T - denotes the size of the primary (primary) tumor that appears in the mouth. Size is marked with T1 to T4, with T1 showing the smallest tumor size and T4 being the largest and deepest tumor. N - indicating the presence or absence of tumor spread (metastasis) in the neck or lymph nodes around; N0 means no spread, and N1, N2, and N3 denote the spread to the neck or lymph nodes around. M - indicating the presence or absence of tumor spread in other body parts. The classification will show how aggressive the mouth cancer you are experiencing, and also in which stage of mouth cancer you experience and the choice of therapy. By knowing the stage and the level of cancer development suffered by the patient, the doctor can determine the treatment step that will need to be done. So also with the patient's health condition and location and type of mouth cancer suffered. Early-stage oral cancer has the highest chance of total recovery. While middle-stage oral cancer may be curable. But advanced-stage oral cancer is generally incurable and treatment is done only to relieve symptoms and slow the spread of cancer. Handling measures for oral cancer include surgery, chemotherapy, and radiotherapy. These three steps are often combined in order to get maximum results. Early-stage oral cancer can be treated by surgery using a laser beam. This procedure is called photodynamic therapy (PDT). But if the cancer has spread to other parts of the body, then removal of the tumor with healthy tissue around it needs to be done. For example, the removal of some tissues on the walls of the mouth, tongue, or even the jaw. The doctor will then perform a reconstruction operation to re-form the part or tissue removed. Currently, cutting-edge technology called 3D printing has been applied to help physicians reconstruct replacement bones that are almost identical to the original ones. Step radiotherapy is usually used after surgery to prevent the return of cancer cells. Radiation therapy can be done from outside or in the body. In dealing with cancer that is already widespread in the body or high risk for growing back, doctors will advise chemotherapy. Drugs used in this process will destroy the DNA from cancer cells in order not to reproduce. But these drugs can also lower the immune system so that patients are susceptible to infection. In addition to the benefits, radiotherapy and chemotherapy potentially cause side effects. Some of them include nausea, vomiting, fatigue, thrush, and a sore mouth. Cetuximab is also sometimes used to treat advanced oral cancer. The use of these drugs is usually combined with radiotherapy or chemotherapy. Cetuximab will attack proteins on the surface of cancer cells to prevent the spread of cancer. But cetuximab is recommended if patients can not undergo chemotherapy for certain medical reasons, such as being pregnant. Each treatment step certainly has a risk of complications. So also with oral cancer treatment. Difficulty swallowing and speech impairment are the major complications that can occur after you have surgery and radiotherapy. Difficulty swallowing include serious complications because it can lead to malnutrition and trigger aspiration pneumonia due to food entering the respiratory tract and caught in the lungs. These complications will generally improve with the healing and treatment process. But it is possible that your swallowing ability will not fully recover. Similarly swallowing, radiotherapy and surgery also potentially cause interference in your speech. Therefore, speech therapy will be very useful to restore your speech. Do not use tobacco of any kind, including smoking. Apply a healthy and balanced diet, especially by increasing consumption of vegetables and fruits. Maintain oral hygiene, eg diligent brushing teeth. Checking dental health regularly, at least once a year. 0 Response to "Mouth Cancer or Oral Cancer"